This article is about the 41st President of the United States. For his son, the 43rd President, see George W. Bush. George Herbert Walker Bush (born June 12, 1924) is an American politician who was the 41st President of the United States from 1989 to 1993 and the 43rd Vice President of the United States from 1981 to 1989. A member of the U.S. Republican Party, he was previously a congressman, ambassador, and Director of Central Intelligence. He is the oldest living former President and Vice President. He is also the last living former President who is a veteran of World War II. 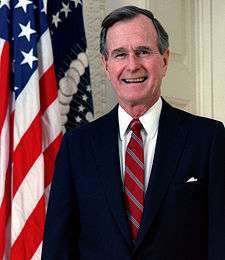 Since 2000, Bush is often referred to as "George H. W. Bush", "Bush 41", "Bush the Elder", or "George Bush Sr." to distinguish him from his eldest son, George W. Bush, who became the 43rd President of the United States. Prior to his son's presidency, he was simply referred to as George Bush or President Bush. Bush was born in Milton, Massachusetts, to Prescott Bush and Dorothy Walker Bush. Following the attack on Pearl Harbor in 1941, Bush postponed college, enlisted in the U.S. Navy on his 18th birthday, and became the youngest aviator in the U.S. Navy at the time. He served until the end of the war, then attended Yale University. Graduating in 1948, he moved his family to West Texas and entered the oil business, becoming a millionaire by the age of 40. 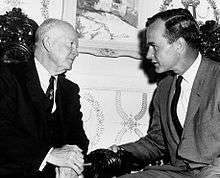 Bush became involved in politics soon after founding his own oil company, serving as a member of the House of Representatives and Director of Central Intelligence, among other positions. He failed to win the Republican nomination for President in 1980, but was chosen as a running mate by party nominee Ronald Reagan, and the two were elected. During his tenure, Bush headed administration task forces on deregulation and fighting the "War on Drugs". In 1988, Bush ran a successful campaign to succeed Reagan as President, defeating Democratic opponent Michael Dukakis. Foreign policy drove the Bush presidency: military operations were conducted in Panama and the Persian Gulf; the Berlin Wall fell in 1989, and the Soviet Union dissolved two years later. Domestically, Bush reneged on a 1988 campaign promise and, after a struggle with Congress, signed an increase in taxes that Congress had passed. In the wake of a weak recovery from an economic recession, along with continuing budget deficits and the controversy over his appointment of Clarence Thomas to the Supreme Court, he lost the 1992 presidential election to Democrat Bill Clinton. Bush left office in 1993. His presidential library was dedicated in 1997, and he has been active—often alongside Bill Clinton—in various humanitarian activities. Besides being the 43rd president (2001–09), his son George also served as the 46th Governor of Texas (1995–2000) and is one of only two presidents—the other being John Quincy Adams—to be the son of a former president. His second son, Jeb Bush, served as the 43rd Governor of Florida (1999–2007) and made an unsuccessful run for the Republican Party nomination for the office in 2016. George Herbert Walker Bush was born at 173 Adams Street in Milton, Massachusetts, on June 12, 1924 to Prescott Sheldon Bush and Dorothy (Walker) Bush. The Bush family moved from Milton to Greenwich, Connecticut, shortly after his birth. Growing up, his nickname was "Poppy". Bush began his formal education at the Greenwich Country Day School in Greenwich. Beginning in 1936, he attended Phillips Academy in Andover, Massachusetts, where he held a number of leadership positions including president of the senior class, secretary of the student council, president of the community fund-raising group, a member of the editorial board of the school newspaper, and captain of both the varsity baseball and soccer teams. Following the attack on Pearl Harbor in December 1941, Bush decided to join the US. Navy, so after graduating from Phillips Academy in 1942, he became a naval aviator at the age of 18. After completing the 10-month course, he was commissioned as an ensign in the United States Naval Reserve at Naval Air Station Corpus Christi on June 9, 1943, just three days before his 19th birthday, which made him the youngest naval aviator to that date. He was assigned to Torpedo Squadron (VT-51) as the photographic officer in September 1943. The following year, his squadron was based on the USS San Jacinto as a member of Air Group 51, where his lanky physique earned him the nickname "Skin". During this time, the task force was victorious in one of the largest air battles of World War II: the Battle of the Philippine Sea. After Bush's promotion to Lieutenant (junior grade) on August 1, 1944, the San Jacinto commenced operations against the Japanese in the Bonin Islands. Bush piloted one of four Grumman TBM Avenger aircraft from VT-51 that attacked the Japanese installations on Chichijima. His crew for the mission, which occurred on September 2, 1944, included Radioman Second Class John Delaney and Lieutenant Junior Grade William White. During their attack, the Avengers encountered intense anti-aircraft fire; Bush's aircraft was hit by flak and his engine caught on fire. Despite his plane being on fire, Bush completed his attack and released bombs over his target, scoring several damaging hits. With his engine ablaze, Bush flew several miles from the island, where he and one other crew member on the TBM Avenger bailed out of the aircraft; the other man's parachute did not open. 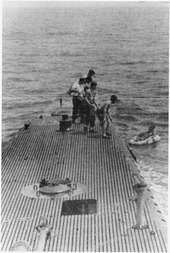 Bush waited for four hours in an inflated raft, while several fighters circled protectively overhead until he was rescued by the lifeguard submarine USS Finback. For the next month he remained on the Finback, and participated in the rescue of other pilots. Several of those shot down during the attack were executed and eaten by their captors. Bush subsequently returned to San Jacinto in November 1944 and participated in operations in the Philippines until his squadron was replaced and sent home to the United States. Through 1944, he flew 58 combat missions for which he received the Distinguished Flying Cross, three Air Medals, and the Presidential Unit Citation awarded to San Jacinto. Because of his valuable combat experience, Bush was reassigned to Norfolk Navy Base and put in a training wing for new torpedo pilots. He was later assigned as a naval aviator in a new torpedo squadron, VT-153, based at Naval Air Station Grosse Ile, Michigan. Upon the Japanese surrender in 1945, Bush was honorably discharged in September of that year. George Bush married Barbara Pierce on January 6, 1945, only weeks after his return from the Pacific. The couple's first residence was a small rented apartment in Trenton, Michigan, near Bush's Navy assignment at NAS Grosse Ile. Their marriage produced six children: George Walker Bush (born 1946), Pauline Robinson "Robin" Bush (1949–1953, died of leukemia), John Ellis "Jeb" Bush (born 1953), Neil Mallon Pierce Bush (born 1955), Marvin Pierce Bush (born 1956), and Dorothy Bush Koch (born 1959). Bush had been accepted to Yale University prior to his enlistment in the military and took up the offer after his discharge and marriage. While at Yale, he was enrolled in an accelerated program that allowed him to graduate in two and a half years, rather than four. He was a member of the Delta Kappa Epsilon fraternity and was elected its president. He also captained the Yale baseball team, and as a left-handed first baseman, played in the first two College World Series. As the team captain, Bush met Babe Ruth before a game during his senior year. He was also, like his father, a member of the Yale cheerleading squad. Late in his junior year he was, like his father Prescott Bush (1917), initiated into the Skull and Bones secret society. He graduated as a member of the Phi Beta Kappa from Yale in 1948 with a Bachelor of Arts degree in economics. Bush served as Chairman of the Republican Party for Harris County, Texas in 1964, but wanted to be more involved in policy making, so he set his sights high: he aimed for a U.S. Senate seat from Texas. After winning the Republican primary, Bush faced his opponent, incumbent Democrat Ralph W. Yarborough, who attacked Bush as a right-wing extremist. Bush was a strong supporter of Republican Senator Barry Goldwater, who headed the Republican ticket as the presidential candidate. Like Goldwater, Bush strongly opposed civil rights legislation in the name of states rights. Yarborough, a leading Texas liberal, supported the civil rights legislation and was reelected by 56% - 44%. The Republican candidate for governor, Jack Crichton of Dallas, who often campaigned alongside Bush before the election, lost by a much wider margin to Governor John B. Connally Jr. Bush and the Harris County Republicans played a role in the development of the new Republican Party of the late 20th century. First, Bush worked to absorb the John Birch Society members, who were trying to take over the Republican Party. Second, during and after the Civil Rights Movement, Democrats in the South who were committed to segregation left their party, and although the "country club Republicans" had differing ideological beliefs, they found common ground in hoping to expel the Democrats from power. Bush was elected in 1966 to a House of Representatives seat from the 7th District of Texas, defeating with 57 percent of the ballots cast the Democrat Frank Briscoe, the district attorney of Harris County known for his law and order credentials and a cousin of later Governor Dolph Briscoe. Bush was the first Republican to represent Houston in the U.S. House. Bush's representative district included Tanglewood, the Houston neighborhood that was his residence; his family had moved into Tanglewood in the 1960s. His voting record in the House was generally conservative: Bush voted for the Civil Rights Act of 1968, although it was generally unpopular in his district. He supported the Nixon administration's Vietnam policies, but broke with Republicans on the issue of birth control, which he supported. Despite being a first-term congressman, Bush was appointed to the powerful House Ways and Means Committee, where he voted to abolish the military draft. He was elected to a second term in 1968. In 1970 Nixon convinced Bush to relinquish his House seat to run for the Senate against Ralph Yarborough, a fierce Nixon critic. In the Republican primary, Bush easily defeated conservative Robert J. Morris, by a margin of 87.6% to 12.4%. Nixon came to Texas to campaign in Longview for Bush and gubernatorial candidate Paul Eggers, a Dallas lawyer who was a close friend of U.S. Senator John G. Tower. Former Congressman Lloyd Bentsen, a more moderate Democrat and native of Mission in south Texas, defeated Yarborough in the Democratic primary. Yarborough endorsed Bentsen, who defeated Bush, 53.4 to 46.6%. As Bush's political career waned, he moved out of Houston and sold his first Tanglewood house, but for periods of time continued to reside in Tanglewood. 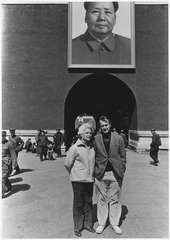 Gerald Ford, Nixon's successor, appointed Bush to be Chief of the U.S. Liaison Office in the People's Republic of China. 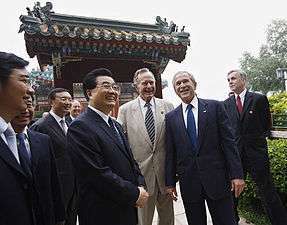 Since the United States at the time maintained official relations with the Republic of China on Taiwan and not the People's Republic of China, the Liaison Office did not have the official status of an embassy and Bush did not formally hold the position of "ambassador", though he unofficially acted as one. The 14 months that he spent in China were largely seen as beneficial for U.S.-China relations. After Ford's accession to the presidency, Bush was under serious consideration for being nominated as Vice President. Ford eventually narrowed his list to Nelson Rockefeller and Bush. White House Chief of Staff Donald Rumsfeld reportedly preferred Rockefeller over Bush. Rockefeller was finally named and confirmed. 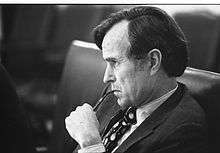 Bush, as CIA Director, listens at a meeting following the assassinations in Beirut of Francis E. Meloy, Jr. and Robert O. Waring, 1976. 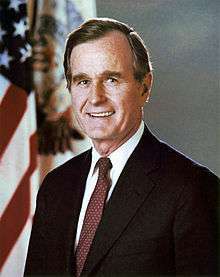 After a Democratic administration took power in 1977, Bush became chairman on the Executive Committee of the First International Bank in Houston. He later spent a year as a part-time professor of Administrative Science at Rice University's Jones School of Business beginning in 1978, the year it opened; Bush said of his time there, "I loved my brief time in the world of academia." Between 1977 and 1979, he was a director of the Council on Foreign Relations foreign policy organization. Bush had decided in the late 1970s that he was going to run for president in 1980; in 1979, he attended 850 political events and traveled more than 250,000 miles (400,000 km) to campaign for the nation's highest office. In the contest for the Republican Party nomination, Bush stressed his wide range of government experience, while competing against rivals Senator Howard Baker of Tennessee, Senator Bob Dole of Kansas, Congressman John Anderson of Illinois (who would later run as an independent), Congressman Phil Crane, also of Illinois, former Governor John Connally of Texas, former Minnesota Governor Harold Stassen, and the front-runner Ronald Reagan, former actor, and Governor of California. In the primary election, Bush focused almost entirely on the Iowa caucuses, while Reagan ran a more traditional campaign. Bush represented the centrist wing in the GOP, whereas Reagan represented conservatives. Bush famously labeled Reagan's supply side-influenced plans for massive tax cuts "voodoo economics". His strategy proved useful, to some degree, as he won in Iowa with 31.5% to Reagan's 29.4%. 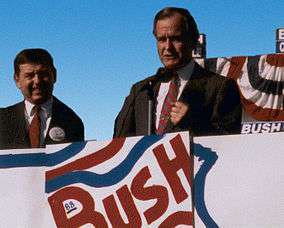 After the win, Bush stated that his campaign was full of momentum, or "Big Mo". As a result of the loss, Reagan replaced his campaign manager, reorganized his staff, and concentrated on the New Hampshire primary. The two men agreed to a debate in the state, organized by the Nashua Telegraph, but paid for by the Reagan campaign. Reagan invited the other four candidates as well, but Bush refused to debate them, and eventually they left. The debate proved to be a pivotal moment in the campaign; when the moderator, John Breen, ordered Reagan's microphone turned off, his angry response, "I am paying for this microphone," struck a chord with the public. Bush ended up losing New Hampshire's primary with 23% to Reagan's 50%. Bush lost most of the remaining primaries as well, and formally dropped out of the race in May of that year. 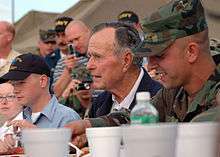 With his political future seeming dismal, Bush sold his house in Houston and bought his grandfather's estate in Kennebunkport, Maine, known as "Walker's Point". 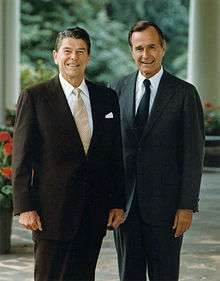 At the Republican Convention, Reagan selected Bush as his Vice Presidential nominee, placing him on the winning Republican presidential ticket of 1980. As Vice President, Bush generally took on a low profile while recognizing the constitutional limits of the office; he avoided decision-making or criticizing Reagan in any way. As had become customary, he and his wife moved into the Vice President's residence at Number One Observatory Circle, about two miles from the White House. After selling the house in the Tanglewood, the Bushes declared a room in The Houstonian Hotel in Houston as their official voting address. The Bushes attended a large number of public and ceremonial events in their positions, including many state funerals, which became a common joke for comedians. Mrs. Bush found the funerals largely beneficial, saying, "George met with many current or future heads of state at the funerals he attended, enabling him to forge personal relationships that were important to President Reagan." As the President of the Senate, Bush stayed in contact with members of Congress, and kept the president informed on occurrences on Capitol Hill. On March 30, 1981, early into the administration, Reagan was shot and seriously wounded in Washington, D.C. Bush, second in command by the presidential line of succession, was in Fort Worth, Texas, and flew back to Washington immediately. Reagan's cabinet convened in the White House Situation Room, where they discussed various issues, including the availability of the Nuclear Football. When Bush's plane landed, his aides advised him to proceed directly to the White House by helicopter, as an image of the government still functioning despite the attack. Bush rejected the idea, responding, "Only the President lands on the South Lawn." This made a positive impression on Reagan, who recovered and returned to work within two weeks. From then on, the two men would have regular Thursday lunches in the Oval Office. In December 1983 Bush flew to El Salvador and warned that country's military leaders to end their death squads and hold fully free elections or face the loss of U.S. aid. Bush's aides feared for his safety and thought about calling the meeting off when they discovered apparent blood stains on the floor of the presidential palace of Álvaro Magaña. Bush was never told of the aides' concerns and a tense meeting was held in which some of Magaña's personnel brandished semiautomatic weapons and refused requests to take them outside. Reagan and Bush ran for reelection in 1984. The Democratic opponent, Walter Mondale, made history by choosing a woman as his running mate, New York Representative Geraldine Ferraro. She and Bush squared off in a single televised Vice Presidential debate. Serving as a contrast to the Ivy-League educated Bush, Ferraro represented a "blue-collar" district in Queens, New York; this, coupled with her popularity among female journalists, left Bush at a disadvantage. 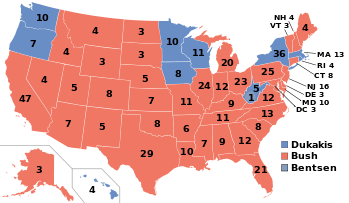 Regardless, the Reagan-Bush ticket won in a landslide against the Mondale-Ferraro ticket. Early into his second term as Vice President, Bush and his aides were planning a run for the presidency in 1988. By the end of 1985, a committee had been established and over two million dollars raised for Bush. Bush became the first Vice President to serve as Acting President when, on July 13, 1985, Reagan underwent surgery to remove polyps from his colon, making Bush acting president for approximately eight hours. 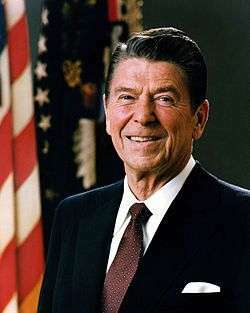 The Reagan administration was shaken by a scandal in 1986, when it was revealed that administration officials had secretly arranged weapon sales to Iran, and had used the proceeds to fund the anticommunist Contras in Nicaragua, a direct violation of the law. When the Iran-Contra Affair, as it became known, broke to the media, Bush, like Reagan, stated that he had been "out of the loop" and unaware of the diversion of funds, although this was later questioned. His diaries from that time stated "I'm one of the few people that know fully the details" and as a result of six pardons by Bush, the independent counsel's final report on the Iran-Contra Affair pointedly noted: "The criminal investigation of Bush was regrettably incomplete." Bush's campaign director Roger Ailes and others were concerned that Bush was seen as a "wimp", an image put to rest by his evident fury in an interview with Dan Rather. In 1988 the USS Vincennes accidentally shot down Iran Air Flight 655 killing 290 passengers. Bush said that he would "never apologize for the United States of America. Ever. I don't care what the facts are." In the January 26, 1987, issue of Time magazine, in an article entitled "Where Is the Real George Bush?" journalist Robert Ajemian reported that a friend of Bush's had urged him to spend several days at Camp David thinking through his plans for his prospective presidency, to which Bush is said to have responded in exasperation, "Oh, the vision thing." This oft-cited quote became a shorthand for the charge that Bush failed to contemplate or articulate important policy positions in a compelling and coherent manner. The phrase has since become a metonym for any politician's failure to incorporate a greater vision in a campaign, and has often been applied in the media to other politicians or public figures. Bush had been planning a presidential run since as early as 1985, and entered the Republican primary for President of the United States in October 1987. His challengers for the Republican presidential nomination included U.S. Senator Bob Dole of Kansas, U.S. Representative Jack Kemp of New York, former Governor Pete DuPont of Delaware, and conservative Christian televangelist Pat Robertson. Though considered the early frontrunner for the nomination, Bush came in third in the Iowa caucus, behind winner Dole and runner-up Robertson. Much as Reagan did in 1980, Bush reorganized his staff and concentrated on the New Hampshire primary. With Dole ahead in New Hampshire, Bush ran television commercials portraying the senator as a tax raiser; he rebounded to win the state's primary. Following the primary, Bush and Dole had a joint media appearance, when the interviewer asked Dole if he had anything to say to Bush, Dole said, in response to the ads, "yeah, stop lying about my record" in an angry tone. This is thought to have hurt Dole's campaign to Bush's benefit. Bush continued seeing victory, winning many Southern primaries as well. Once the multiple-state primaries such as Super Tuesday began, Bush's organizational strength and fundraising lead were impossible for the other candidates to match, and the nomination was his. Leading up to the 1988 Republican National Convention, there was much speculation as to Bush's choice of running mate. Bush chose little-known U.S. Senator Dan Quayle of Indiana, favored by conservatives. Despite Reagan's popularity, Bush trailed Democratic nominee Michael Dukakis, then Governor of Massachusetts, in most polls. Bush, occasionally criticized for his lack of eloquence when compared to Reagan, delivered a well-received speech at the 1988 Republican National Convention. Known as the "thousand points of light" speech, it described Bush's vision of America: he endorsed the Pledge of Allegiance, prayer in schools, capital punishment, gun rights, and opposed abortion. The speech at the convention included Bush's famous pledge: "Read my lips: no new taxes." The general election campaign between the two men was described in 2008 as one of the dirtiest in modern times. Bush blamed Dukakis for polluting the Boston Harbor as the Massachusetts governor. Bush also pointed out that Dukakis was opposed to a law that would require all students to say the Pledge of Allegiance, a topic well covered in Bush's nomination acceptance speech. Dukakis's unconditional opposition to capital punishment led to a pointed question being asked during the presidential debates. Moderator Bernard Shaw asked Dukakis if Dukakis would hypothetically support the death penalty if his wife, Kitty, were raped and murdered. Dukakis's response of no, as well as a provocative ad about convicted felon Willie Horton, contributed toward Bush's characterization of Dukakis as "soft on crime". Bush defeated Dukakis and his running mate, Lloyd Bentsen, in the Electoral College, by 426 to 111 (Bentsen received one vote from a faithless elector). In the nationwide popular vote, Bush took 53.4% of the ballots cast while Dukakis received 45.6%. Bush became the first serving Vice President to be elected President since Martin Van Buren in 1836 as well as the first person to succeed someone from his own party to the Presidency via election to the office in his own right since Herbert Hoover in 1929. Early in his term, Bush faced the problem of what to do with leftover deficits spawned by the Reagan years. At $220 billion in 1990, the deficit had grown to three times its size since 1980. Bush was dedicated to curbing the deficit, believing that America could not continue to be a leader in the world without doing so. He began an effort to persuade the Democratic controlled Congress to act on the budget; with Republicans believing that the best way was to cut government spending, and Democrats convinced that the only way would be to raise taxes, Bush faced problems when it came to consensus building. In the wake of a struggle with Congress, Bush was forced by the Democratic majority to raise tax revenues; as a result, many Republicans felt betrayed because Bush had promised "no new taxes" in his 1988 campaign. Perceiving a means of revenge, Republican congressmen defeated Bush's proposal which would enact spending cuts and tax increases that would reduce the deficit by $500 billion over five years. Scrambling, Bush accepted the Democrats' demands for higher taxes and more spending, which alienated him from Republicans and gave way to a sharp decrease in popularity. Bush would later say that he wished he had never signed the bill. Near the end of the 101st Congress, the president and congressional members reached a compromise on a budget package that increased the marginal tax rate and phased out exemptions for high-income taxpayers. Although he originally demanded a reduction in the capital gains tax, Bush relented on this issue as well. This agreement with the Democratic leadership in Congress proved to be a turning point in the Bush presidency; his popularity among Republicans never fully recovered. Bush signed a number of major laws in his presidency, including the Americans with Disabilities Act of 1990; this was one of the most pro-civil rights bills in decades. He is also the only President to successfully veto a civil rights act, having vetoed the job-discrimination protection Civil Rights Act of 1990. Bush feared racial quotas would be imposed, but later approved watered-down Civil Rights Act of 1991. He worked to increase federal spending for education, childcare, and advanced technology research. He also signed the Radiation Exposure Compensation Act which provides monetary compensation of people who had contracted cancer and a number of other specified diseases as a direct result of their exposure to atmospheric nuclear testing undertaken by the United States during the Cold War, or their exposure to high levels of radon while doing uranium mining. In dealing with the environment, Bush reauthorized the Clean Air Act, requiring cleaner burning fuels. He quarreled with Congress over an eventually signed bill to aid police in capturing criminals, and signed into law a measure to improve the nation's highway system. Bush signed the Immigration Act of 1990, which led to a 40 percent increase in legal immigration to the United States. In 1989, just after the fall of the Berlin Wall, Bush met with Soviet General Secretary Mikhail Gorbachev in a conference on the Mediterranean island of Malta. The administration had been under intense pressure to meet with the Soviets, but not all initially found the Malta Summit to be a step in the right direction; General Brent Scowcroft, among others, was apprehensive about the meeting, saying that it might be "premature" due to concerns where, according to Condoleezza Rice, "expectations [would be] set that something was going to happen, where the Soviets might grandstand and force [the U.S.] into agreements that would ultimately not be good for the United States." But European leaders, including François Mitterrand and Margaret Thatcher, encouraged Bush to meet with Gorbachev, something that he did December 2 and 3, 1989. Though no agreements were signed, the meeting was viewed largely as being an important one; when asked about nuclear war, Gorbachev responded, "I assured the President of the United States that the Soviet Union would never start a hot war against the United States of America. And we would like our relations to develop in such a way that they would open greater possibilities for cooperation.... This is just the beginning. We are just at the very beginning of our road, long road to a long-lasting, peaceful period." The meeting was received as a very important step to the end of the Cold War. 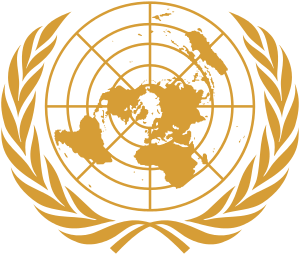 Faced with a humanitarian disaster in Somalia, exacerbated by a complete breakdown in civil order, the United Nations had created the UNOSOM I mission in April 1992 to aid the situation through humanitarian efforts, though the mission failed. 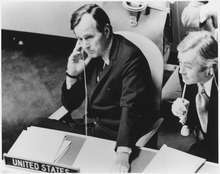 The Bush administration proposed American aid to the region by assisting in creating a secure environment for humanitarian efforts and UN Resolution 794 was unanimously adopted by the Security Council on December 3, 1992. A lame duck president, Bush launched Operation Restore Hope the following day under which the United States would assume command in accordance with Resolution 794. Fighting would escalate and continue into the Clinton administration. 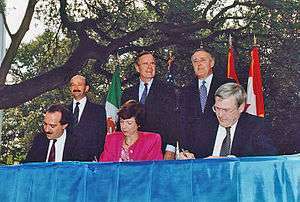 Bush's administration, along with the Progressive Conservative Canadian Prime Minister Brian Mulroney, spearheaded the negotiations of the North American Free Trade Agreement (NAFTA), which would eliminate the majority of tariffs on products traded among the United States, Canada, and Mexico, to encourage trade amongst the countries. The treaty also restricts patents, copyrights, and trademarks, and outlines the removal of investment restrictions among the three countries. On January 8, 1992, Bush fainted after vomiting at a banquet hosted by the then Prime Minister of Japan, Kiichi Miyazawa. Bush was suffering from gastroenteritis. As other presidents have done, Bush issued a series of pardons during his last days in office. On December 24, 1992, he granted executive clemency to six former government employees implicated in the Iran-Contra scandal of the late 1980s, most prominently former Secretary of Defense Caspar Weinberger. Bush described Weinberger, who was scheduled to stand trial on January 5, 1993, for criminal charges related to Iran-Contra, as a "true American patriot". Harvard University awarded a Doctor of Laws degree on May 29, 2014. In 1990 Time magazine named him the Man of the Year. In 1991 the U.S. Navy Memorial Foundation awarded Bush its Lone Sailor award for his naval service and his subsequent government service. In 1993, he was made an Honorary Knight Grand Cross of the Order of the Bath by Queen Elizabeth II. Bush announced his reelection bid in early 1992; with a coalition victory in the Persian Gulf War and high approval ratings, reelection initially looked likely. As a result, many leading Democrats declined to seek their party's presidential nomination. But an economic recession, and doubts of whether Bush ended the Gulf War properly, reduced his popularity. Conservative political columnist Pat Buchanan challenged Bush for the Republican nomination, and shocked political pundits by finishing second, with 37% of the vote, in the New Hampshire primary. Bush responded by adopting more conservative positions on issues, in an attempt to undermine Buchanan's base. Once he had secured the nomination, Bush faced his challenger, Democrat and Governor of Arkansas William Jefferson "Bill" Clinton. Clinton attacked Bush as not doing enough to assist the working middle-class and being "out of touch" with the common man, a notion reinforced by reporter Andrew Rosenthal's false report that Bush was "astonished" to see a demonstration of a supermarket scanner. Clinton had originally been in the lead, until Perot reentered, tightening the race significantly. Nearing election day, polls suggested that the race was a dead-heat, but Clinton pulled out on top, defeating Bush in a 43% to 38% popular vote margin. Perot won 19% of the popular vote, one of the highest totals for a third party candidate in U.S. history, drawing equally from both major candidates, according to exit polls. Bush received 168 electoral votes to Clinton's 370. Several factors were key in Bush's defeat. The ailing economy which arose from recession may have been the main factor in Bush's loss, as 7 in 10 voters said on election day that the economy was either "not so good" or "poor". On the eve of the 1992 election, after unemployment reports of 7.8% appeared (the highest since 1984), Economic recession had contributed to a sharp decline in his approval rating – to just 37%. Conservative Republicans point to Bush's 1990 agreement to raise taxes in contradiction of his famous "Read my lips: no new taxes" pledge. In doing so, Bush alienated many members of his conservative base, losing their support for his re-election. According to one survey, of the voters who cited Bush's broken "No New Taxes" pledge as "very important", two thirds voted for Bill Clinton. Bush had raised taxes in an attempt to address an increasing budget deficit, which has largely been attributed to the Reagan tax cuts and military spending of the 1980s. The tax revenue increase had not hurt his approval ratings to the extent that it prevented it from reaching 89% during the Gulf War, four months after the tax vote. By February 1991 his approval rating rose to its highest level—89%. Upon leaving office, Bush retired with his wife, Barbara, and temporarily moved into a friend's house near the Tanglewood community of Houston as they prepared to build a permanent retirement house nearby. Ultimately they built their retirement house in the community of West Oaks, near Tanglewood. They had a presidential office within the Park Laureate Building on Memorial Drive. Mimi Swartz of National Geographic wrote that "The Bushes are too studiously sedate to live in River Oaks". They spend the summer at Walker's Point in Kennebunkport, Maine. On January 10, 1999, the Bushes became the longest-married Presidential couple in history, outlasting John and Abigail Adams, who were married for 54 years and 3 days. At 70 years as of January 2015, they still hold the record, by a year and a half, over Jimmy and Rosalynn Carter. Bush co-founded an annual fishing tournament in Islamorada, an island in the Florida Keys, which was held annually for 10 years. In 1993, Bush visited Kuwait to commemorate the coalition's victory over Iraq in the Gulf War, where he was targeted in an assassination plot. Kuwaiti authorities arrested 17 people allegedly involved in using a car bomb to kill Bush. Through interviews with the suspects and examinations of the bomb's circuitry and wiring, the FBI established that the plot had been directed by the Iraqi Intelligence Service. A Kuwaiti court later convicted all but one of the defendants. Two months later, in retaliation, Clinton ordered the firing of 23 cruise missiles at Iraqi Intelligence Service headquarters in Baghdad. The day before the strike, U.S. Ambassador to the UN Madeleine Albright went before the Security Council to present evidence of the Iraqi plot. After the missiles were fired, Vice President Al Gore said the attack "was intended to be a proportionate response at the place where this plot" to assassinate Bush "was hatched and implemented". From 1993 to 1999 he served as the chairman to the board of trustees for Eisenhower Fellowships, and from 2007 to 2009 was chairman of the National Constitution Center. 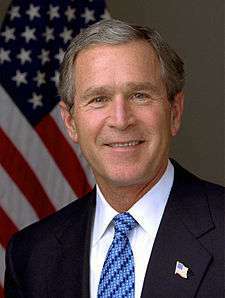 In 1997, the same year as the opening of his Presidential Library, the Houston international airport was renamed George Bush Intercontinental Airport. President Bush is Honorary Chairman of Points of Light, an international nonprofit dedicated to engaging more people and resources in solving serious social problems through voluntary service. His eldest son, George W. Bush, was inaugurated as the 43rd President of the United States on January 20, 2001, and re-elected in 2004. Through previous administrations, the elder Bush had ubiquitously been known as "George Bush" or "President Bush", but following his son's election the need to distinguish between them has made retronymic forms such as "George H. W. Bush" and "George Bush senior" and colloquialisms such as "Bush 41" and "Bush the Elder" much more common. The George Bush Presidential Library is the presidential library named for Bush. This tenth presidential library was built between 1995 and 1997 and contains the presidential and vice-presidential papers of Bush and the vice-presidential papers of Dan Quayle. It was dedicated on November 6, 1997, and opened to the public shortly thereafter; the architectural firm of Hellmuth, Obata and Kassabaum designed the complex. The George Bush Presidential Library and Museum is located on a 90-acre (360,000 m2) site on the west campus of Texas A&M University in College Station, Texas, on a plaza adjoining the Presidential Conference Center and the Texas A&M Academic Center. 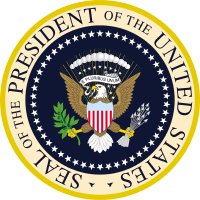 The Library operates under NARA's administration and the Presidential Libraries Act of 1955's provisions. The George Bush School of Government and Public Service is a graduate public policy school at Texas A&M University in College Station, Texas. The graduate school is part of the presidential library complex, and offers four programs: two master's degree programs (Public Service Administration and International Affairs) and two certificate programs (Advanced International Affairs and Homeland Security). The master's program in International Affairs (MPIA) program offers concentration on either National Security Affairs or International Economics and Development. Bush continues to make many public appearances. He and Mrs. Bush attended the state funeral of Ronald Reagan in June 2004, and of Gerald Ford in January 2007. One month later, he was awarded the Ronald Reagan Freedom Award in Beverly Hills, California, by former First Lady Nancy Reagan. Despite his political differences with Bill Clinton, it has been acknowledged that the two former presidents have become friends. He and Clinton appeared together in television ads in 2005, encouraging aid for victims of Hurricane Katrina and the 2004 Indian Ocean tsunami. In October 2006, Bush was honored by the National Italian American Foundation (NIAF) with the NIAF One America Award for fundraising, with Bill Clinton, for the victims of the 2004 tsunami and Hurricane Katrina. Upon the death of Gerald Ford, Bush became the oldest living (former) president, 111 days older than Jimmy Carter. On February 18, 2008, Bush formally endorsed Senator John McCain for the presidency of the United States. The endorsement offered a boost to McCain's campaign, as the Arizona Senator had been facing criticism among many conservatives. On January 10, 2009, both George H. W. and George W. Bush were present at the commissioning of the USS George H.W. Bush (CVN-77), the tenth and last Nimitz-class supercarrier of the United States Navy. Bush paid a visit to the carrier again on May 26, 2009. On February 15, 2011, he was awarded the Presidential Medal of Freedom—the highest civilian honor in the United States—by President Barack Obama. Bush suffers from Vascular Parkinsonism, a form of Parkinson's disease which has forced him to use a motorized scooter or wheelchair since at least 2012. In July 2013, Bush had his head shaved in a show of support for the two-year-old son of a member of his security detail, who had leukemia. In April 2014, Frederick D. McClure, chief executive of the Bush library foundation, organized a three-day gathering in College Park, Texas, to mark the 25th anniversary of the Bush administration. Also in early 2014, the John F. Kennedy Library Foundation presented the Profile in Courage Award to Bush and Mount Vernon awarded him its first Cyrus A. Ansary Prize. The Kennedy foundation award was presented by Jack Schlossberg, the late president's grandson, to Lauren Bush Lauren, who accepted on her grandfather's behalf. The Ansary prize was presented in Houston with Ansary, Barbara Lucas, Ryan C. Crocker, dean of the Bush school since January 2010, Barbara Bush, and Curt Viebranz in attendance with the former president. Fifty thousand dollars of the prize was directed by Bush to the Bush school at Texas A&M and $25,000 will fund an animation about the Siege of Yorktown for Mt. Vernon. Viebranz and Lucas represented Mount Vernon at the presentation. On June 12, 2014, Bush fulfilled a long-standing promise by skydiving on his 90th birthday. He made the parachute jump from a helicopter near his home at 11:15 a.m. in Kennebunkport, Maine. The jump marked the eighth time the former president had skydived, including jumps on his 80th and 85th birthday as well. He had tweeted about the incident prior to the jump, saying "It's a wonderful day in Maine — in fact, nice enough for a parachute jump." In July 2015, Bush suffered a severe neck injury. Wearing a neck brace in October in his first public engagement since the accident, he threw the ceremonial first pitch for the Houston Astros at Minute Maid Park, at the age of 91. 1 2 3 4 5 6 7 8 9 10 "Lieutenant Junior Grade George Bush, USNR". Naval Historical Center. April 6, 2001. Archived from the original on April 10, 2010. Retrieved March 29, 2008. 1 2 "George H. W. Bush". The White House. Retrieved April 11, 2008. ↑ "Presidential Avenue: George Bush". Presidential Avenue. Retrieved March 29, 2008. ↑ Eun Kyung Kim (14 August 2015). "Jenna Bush Hager welcomes second daughter — named after George H.W. Bush". Today.com. The new bundle of joy is named after Jenna's grandfather and former President George H.W. Bush, whose nickname growing up was "Poppy." 1 2 "Former President George Bush honored at his 60th reunion at Phillips Academy, Andover". Phillips Academy. June 8, 2002. Archived from the original on April 1, 2008. Retrieved March 29, 2008. ↑ Adams, Kathy (January 10, 2009). "San Jacinto veterans reunite, recall the one they called 'Skin'". The Virginian Pilot. Landmark Communications. Retrieved January 10, 2009. ↑ "Story of George H. W. Bush World War II Experience". CNN. December 20, 2003. 1 2 "History's Youngest Naval Aviator: George H. W. Bush". Mid-Atlantic Air Museum. Retrieved March 29, 2008. ↑ Bradley, James (2003). Flyboys. Little, Brown and Company. ISBN 978-0-316-10584-2. ↑ "George Herbert Walker Bush (1924–)". Miller Center of Public Affairs. 2008. Retrieved March 29, 2008. 1 2 3 "School House to White House: The Education of the Presidents". National Archives. Spring 2007. Retrieved March 29, 2008. ↑ Kakutani, Michiko (November 11, 2014). "Love Flows, President to President". New York Times. Retrieved November 14, 2014. ↑ Berkower, Simone. "Cheerleading of the '20s: Epitome of masculinity". Yale Daily News. Retrieved July 30, 2016. 1 2 3 "George Herbert Walker Bush". CNN. Archived from the original on March 8, 2008. Retrieved March 29, 2008. 1 2 3 4 5 6 7 8 9 10 11 12 13 14 15 16 17 "Bush, George Herbert Walker". Scholastic Library Publishing, Inc. Archived from the original on June 15, 2008. Retrieved March 29, 2008. ↑ "George Bush Collection". George Bush Presidential Library and Museum. Retrieved July 30, 2016. ↑ "George Herbert Walker Bush". Net Industries. Retrieved March 29, 2008. ↑ Bush, George W. 41: A Portrait of My Father. Crown Publishers, 2014, p. 64. 1 2 3 4 5 6 7 8 9 10 11 12 13 14 15 16 17 18 George Herbert Walker Bush. MSN Encarta. Archived from the original on October 31, 2009. Retrieved March 29, 2008. ↑ "Presidential Purses - TIME". Time.com. Retrieved September 18, 2015. ↑ Jon Meacham (2015). Destiny and Power: The American Odyssey of George Herbert Walker Bush. Random House. pp. 117–22. ↑ "TX US Senate". Our Campaigns. Retrieved March 19, 2008. ↑ "Program Transcript. George H. W. Bush . WGBH , American Experience". PBS. Retrieved August 13, 2012. ↑ "TX District 07". Our Campaigns. Retrieved March 19, 2008. ↑ "Ex-DA Frank Briscoe, legal heavyweight for decades, dies at 84, January 5, 2011". Houston Chronicle. Retrieved March 9, 2014. 1 2 Hickey, Elisabeth. "Bushes' lot: No room for real estate". The Washington Times. Thursday November 19, 1992. Part E Life E1. Accessed on LexisNexis. 1 2 3 Feldman, Claudia. "Moving back to the 'hood . . ./CITIZEN BUSH". The Houston Chronicle. Sunday December 13, 1992. Lifestyle p. 1. Retrieved on October 15, 2012. ↑ "TX District 7". Our Campaigns. Retrieved March 19, 2008. ↑ "TX US Senate – R Primary". Our Campaigns. Retrieved March 19, 2008. ↑ ""Richard Nixon: Remarks at Longview, Texas", October 28, 1970". presidency.ucsb.edu. Retrieved November 29, 2009. ↑ "The President (Richard Nixon)". Richard Nixon Presidential Library. Retrieved March 29, 2008. ↑ "George HW on Nixon resignation". US News and World Report. July 16, 2006. Archived from the original on June 24, 2008. Retrieved March 29, 2008. 1 2 3 4 5 6 7 8 9 10 11 12 13 14 Hatfield, Mark (with the Senate Historical Office) (1997). 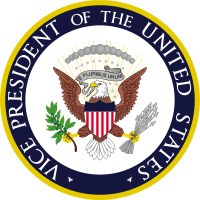 "Vice Presidents of the United States: George H. W. Bush (1981–1989)" (PDF). Washington, D.C.: U.S. Government Printing Office. Retrieved November 4, 2015. ↑ Carl Colby (director) (September 2011). The Man Nobody Knew: In Search of My Father, CIA Spymaster William Colby (Motion picture). New York City: Act 4 Entertainment. Retrieved October 10, 2011. ↑ "The George Bush Center for Intelligence". Central Intelligence Agency. April 5, 2007. Retrieved September 5, 2011. ↑ "Presidents: George H. W. Bush, 41st President of the United States". U-S-History.com. Retrieved March 29, 2008. ↑ "CIA Briefings of Presidential Candidates; Chapter 5: In-Depth Discussions With Carter". 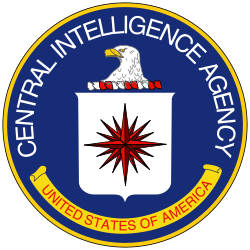 Central Intelligence Agency: Center for the Study of Intelligence. Retrieved October 11, 2007. ↑ Shapiro, T. Rees (August 29, 2010). "E. Henry Knoche, 85; a key player in the intelligence game". The Washington Post. ↑ "George H. W. Bush". Presidential Timeline of the Twentieth Century. Archived from the original on May 3, 2008. Retrieved July 30, 2016. ↑ "President George H. W. Bush: Kyiv National Taras Shevchenko University". Ukrainian Embassy. May 21, 2004. Archived from the original on May 19, 2008. Retrieved March 29, 2008. ↑ "The Council on Foreign Relations from 1921 to 1996 – Historical Roster of Directors and Officers". ↑ Bumiller, Elisabeth (July 8, 2002). "White House Letter; At Parents' Home, Bush Resumes Role of Son". The New York Times. Retrieved April 2, 2008. ↑ John Solomon (March 20, 2011). "A Wimp He Wasn't". Newsweek. Retrieved May 22, 2011. ↑ "Bush-Ferraro Vice-Presidential Debate". The American Presidency Project. October 11, 1984. Archived from the original on June 17, 2008. Retrieved April 3, 2008. ↑ "Transcript" (fee required). The New York Times. June 30, 1997. Retrieved April 2, 2008. ↑ "The Iran-Contra Affair 20 Years On". George Washington University. November 20, 2006. Retrieved April 3, 2008. ↑ "The Iran-Contra Affair 20 Years On". Gwu.edu. Retrieved January 16, 2012. ↑ "When should a president say he's sorry?". The Washington Post. November 8, 2013. ↑ Ajemian, Robert (January 26, 1987). "Where Is the Real George Bush?". Time. Retrieved October 15, 2012. ↑ "Meg Whitman's "Vision Thing"". The Huffington Post. ↑ Andrew Sparrow. "Gordon Brown's Labour conference speech - live". the Guardian. ↑ Apple Jr, R. W. (February 10, 1988). "Bush and Simon Seen as Hobbled by Iowa's Voting". The New York Times. Retrieved April 4, 2008. ↑ "New Hampshire: Picking a President". The History Channel. Archived from the original on April 24, 2008. Retrieved April 4, 2008. 1 2 3 "1988: George H. W. Bush Gives the 'Speech of his Life'". NPR. 2000. Retrieved April 4, 2008. 1 2 3 "1988: Bush wins with 'no new taxes' promise". BBC News. November 9, 1988. Retrieved April 4, 2008. ↑ "The Second Bush-Dukakis Presidential Debate". Commission on Presidential debates. October 13, 1988. Archived from the original on April 6, 2008. Retrieved April 4, 2008. ↑ "George H. W. Bush: Inaugural Address". Bushlibrary.tamu.edu. January 20, 1989. Archived from the original on April 20, 2004. ↑ "George Bush: Remarks on the 20th Anniversary of the Apollo 11 Moon Landing". Presidency.ucsb.edu. July 16, 1969. Retrieved May 22, 2011. ↑ Devroy, Ann. "Bush Vetoes Civil Rights Bill; Measure Said to Encourage Job Quotas; Women, Minorities Sharply Critical". The Washington Post October 23, 1990, Print. Note:(Andrew Johnson and Ronald Reagan had vetoed the Civil Rights Act of 1866 and the Civil Rights Restoration Act of 1987, respectively, but both were successfully overridden by Congress). ↑ Holmes, Steven A. (October 23, 1990). "President Vetoes Bill on Job Rights; Showdown is Set". The New York Times. Retrieved March 21, 2013. ↑ Feldman, Richard (2011). Ricochet: Confessions of a Gun Lobbyist. John Wiley & Sons. ISBN 978-1-118-13100-8. ↑ Carter, Gregg Lee (2002). Guns in American Society: An Encyclopedia of History, Politics, Culture, and the Law. 1. ABC-CLIO. p. 38. ISBN 978-1-57607-268-4. ↑ Tatalovich, Raymond; Byron W. Daynes (1998). Moral controversies in American politics: cases in social regulatory policy (2 ed.). M. E. Sharpe. pp. 168–175. ISBN 978-1-56324-994-5. 1 2 3 The Points of Light Movement: The President's Report to the Nation. Executive Office of the President, 1993. ↑ Perry, Suzanne (October 15, 2009). "After Two Tough Years, New Points of Light Charity Emerges". Chronicle of Philanthropy. Retrieved May 23, 2013. ↑ Edward, Deborah (2008). "Getting to Yes: The Points of Light and Hands On Network Merger" (PDF). RGK Center for Philanthropy and Community Service, The University of Texas at Austin. Retrieved May 23, 2013. ↑ "Points of Light 2012 Year in Review" (PDF). Points of Light. Retrieved May 23, 2013. ↑ "President Obama to Hold Presidential Forum on Service Hosted by former President George H.W. Bush". The White House, Office of the Press Secretary. September 11, 2009. Retrieved May 23, 2013. ↑ Jaffe, Matthew (March 21, 2011). "Former Presidents Gather For Tribute to George H.W. Bush and Volunteer Service". ABC News. Retrieved July 30, 2016. ↑ "Health Matters 07/10/13". Leader-Telegram. July 10, 2013. Retrieved July 11, 2013. ↑ Landler, Mark (July 15, 2013). "At White House Homecoming, Elder Bush's 'Points of Light' Shine On". The New York Times. Retrieved July 18, 2013. ↑ Rucker, Philip (July 15, 2013). "Obama pays tribute to George H.W. Bush". The Washington Post. Retrieved July 18, 2013. ↑ Levine, Dan (April 6, 2011). "Gay judge never considered dropping Prop 8 case". Reuters. Retrieved April 6, 2011. 1 2 Franklin, Jane (2001). "Panama: Background and Buildup to Invasion of 1989". Rutgers University. Retrieved April 11, 2008. 1 2 "Prudence in Panama: George H. W. Bush, Noriega, and economic aid, May 1989 – May 1990". Texas A&M University. April 25, 2007. Retrieved April 11, 2008. ↑ "Richard B. Cheney". United States Department of Defense. Archived from the original on April 11, 2008. Retrieved July 30, 2008. ↑ Baker, Russell (January 3, 1990). "Observer; Is This Justice Necessary?". The New York Times. Retrieved December 12, 2007. ↑ John Pike, ed. (April 27, 2005). "Operation Just Cause". Retrieved December 12, 2007. ↑ "Interview with Dr. Condoleezza Rice". George Washington University. December 17, 1997. Retrieved April 11, 2008. ↑ "The Malta Summit; Transcript of the Bush-Gorbachev News Conference in Malta". The New York Times. Associated Press. December 4, 1989. Retrieved April 11, 2008. ↑ "1989: Malta summit ends Cold War". BBC News. December 3, 1989. Retrieved April 11, 2008. ↑ "1991: Superpowers to cut nuclear warheads". BBC News. July 31, 1991. Retrieved April 11, 2008. 1 2 3 4 "The Gulf War: A Chronology". PBS. Retrieved April 11, 2008. ↑ "George H. W. Bush: Address Before a Joint Session of the Congress on the Persian Gulf Crisis and the Federal Budget Deficit". September 11, 1990. ↑ "A World Transformed". Snopes.com. 2003. Retrieved April 11, 2008. ↑ "UNITED NATIONS OPERATION IN SOMALIA I, UN Dept of Peacekeeping". United Nations. Retrieved May 22, 2011. ↑ Atkinson, Rick (1994). "Night of a Thousand Casualties". The Washington Post (online, January 31). Retrieved November 4, 2015. ↑ "Frequently Asked Questions: NAFTA". Federal Express. Retrieved April 11, 2008. ↑ "The NAFTA Labor Side Accord". Human Rights Watch. Retrieved April 11, 2008. ↑ "NAFTA". Duke University. Archived from the original on April 20, 2008. Retrieved July 30, 2016. 1 2 Gutierrez, Carlos M (March 1, 2008). "Stop Hating on NAFTA". The Washington Post. Retrieved April 11, 2008. ↑ Sweeney, John J (March 21, 2005). "A Bad Deal on Free Trade". Boston Globe. Common Dreams News Center. Archived from the original on September 15, 2008. Retrieved April 11, 2008. 1 2 "Bush pardons Weinberger, Five Other Tied to Iran-Contra". Federation of American Scientists. Retrieved April 11, 2008. ↑ "Pardons and Commutations Granted by President George H. W. Bush". United States Department of Justice. Retrieved May 17, 2008. ↑ "Texas A&M Honorary Degrees". Texas A&M University. December 25, 2014. ↑ "Bush's brother eyes Senate". Record-Journal. September 14, 1981. ↑ Boutwell, Susan J. (May 12, 2011). "Former President George H.W. Bush Among Nine Dartmouth Honorary Degree Recipients". Dartmouth University. Retrieved July 30, 2016. ↑ "Honorary Degrees". Harvard University. ↑ "Bush, Bloomberg, and Others Awarded Honorary Degrees Thursday Morning". thecrimson.com. 1 2 "Honours: Order of the Bath". The British Monarchy Today. Archived from the original on May 30, 2008. Retrieved March 28, 2008. 1 2 "Maybe I'm Amazed". Snopes.com. April 1, 2001. Archived from the original on May 27, 2012. Retrieved April 11, 2008. 1 2 Rosenthal, Andrew (1992). "Bush Encounters the Supermarket, Amazed". The New York Times (February 5). Retrieved November 5, 2015. ↑ "The Perot Vote". President and Fellows of Harvard College. Retrieved April 23, 2008. ↑ Holmes, Steven A (October 27, 1992). "The 1992 Campaign: The Independent; Bush Aide calls Perot's story 'paranoid'". The New York Times. Retrieved April 14, 2008. ↑ Toner, Robin (October 25, 1992). "The 1992 Campaign: The Overview; Contest tightens as Perot Resurges and Clinton slips". The New York Times. Retrieved April 14, 2008. ↑ Holmes, Steven A. (November 5, 1992). "THE 1992 ELECTIONS: DISAPPOINTMENT – NEWS ANALYSIS An Eccentric but No Joke; Perot's Strong Showing Raises Questions On What Might Have Been, and Might Be –". The New York Times. Retrieved September 5, 2010. ↑ "George Herbert Walker Bush: Campaigns and Elections". Miller Center of Public Affairs. Retrieved April 11, 2008. ↑ R. W. Apple Jr. (November 4, 1992). "THE 1992 ELECTIONS: NEWS ANALYSIS; The Economy's Casualty –". The New York Times. Pennsylvania; Ohio; New England States (Us); Michigan; West Coast; New Jersey; Middle East. Retrieved September 5, 2010. ↑ Lazarus, David (June 9, 2004). "Downside of the Reagan Legacy". The San Francisco Chronicle. Retrieved April 11, 2008. ↑ WSJ Research (2015). "How the Presidents Stack Up: A Look at U.S. Presidents' Job Approval Ratings (George H.W. Bush)". The Wall Street Journal. Retrieved November 4, 2015. ↑ "Presidency on Life Support". Pollingreport.com. Retrieved September 5, 2010. ↑ Schmalz, Jeffrey (November 4, 1992). "Clinton Carves a Path Deep Into Reagan Country". The New York Times. Retrieved May 21, 2008. ↑ "The Independent, ' ' George H. W. Bush". The Independent. UK. January 22, 2009. Retrieved September 5, 2010. ↑ "The Prudence Thing: George Bush's Class Act". Foreign Affairs. November 1, 1998. Retrieved September 5, 2010. ↑ Ajemian, Robert (January 26, 1987). "Where Is the Real George Bush?". Time. Retrieved May 3, 2010. ↑ "Quotations : Oxford Dictionaries Online". Askoxford.com. Archived from the original on February 4, 2003. Retrieved July 30, 2016. ↑ Helen Thomas; Craig Crawford. Listen Up, Mr. President: Everything You Always Wanted Your President to Know and Do. Scribner. ISBN 978-1-4391-4815-0. ↑ "Joseph A. Palermo: Meg Whitman's "Vision Thing"". Huffington Post. September 26, 2009. Retrieved September 5, 2010. ↑ "It's time to do the 'vision' thing: Times Argus Online". Timesargus.com. September 29, 2009. Retrieved September 5, 2010. ↑ Zbigniew Mazurak. "Blog Archive » Sarah Palin as a GOP Nominee?". The Reality Check. Retrieved September 5, 2010. ↑ Rothkopf, David (October 1, 2009). "Obama does not want to become known as 'The Great Ditherer'". Foreign Policy. Retrieved September 5, 2010. ↑ "George H. W. Bush". The White House. June 12, 1924. Retrieved September 5, 2010. ↑ "Modest Bush Approval Rating Boost at War's End: Summary of Findings – Pew Research Center for the People & the Press". People-press.org. Retrieved September 5, 2010. ↑ "George H. W. Bush". American Experience. PBS. October 3, 1990. Retrieved September 5, 2010. ↑ Langer, Gary (January 17, 2001). "Poll: Clinton Legacy Mixed". ABC News. Retrieved April 11, 2008. ↑ Paul Steinhauser. "CNN, Views soften on 2 former presidents, CNN poll finds". CNN. Retrieved September 5, 2010. ↑ "From White House to 'regular house'". Associated Press at the Ocala Star-Banner. Saturday November 21, 1992. 2A. Retrieved from Google Books (2 of 84) on October 14, 2012. ↑ "Bushes upbeat for step-down". Fort Worth Star-Telegram. January 10, 1993. 1 News. Retrieved on October 15, 2012. "Bush's Houston office will be in the Park Laureate Building on Memorial Drive"
↑ Swartz, Mimi. "Survival of the Richest." National Geographic. March 2006. Retrieved on June 4, 2014. ↑ Stritoff, Sherri & Bob. "Barbara and George H. Bush". About.com. Retrieved April 24, 2013. ↑ Reiley, Laura (February 13, 2013). "Florida Keys' Cheeca Lodge a plush getaway" (February 13, 2013). Tampa Bay Times. Tampa Bay Times. Retrieved November 22, 2016. ↑ "Cheeca Lodge History". cheeca.com. Retrieved November 22, 2016. ↑ "frontline: the long road to war: assassination". PBS. Retrieved September 5, 2010. ↑ "Points of Light: Our Leadership". Points of Light. Retrieved May 23, 2013. ↑ "The Birth of the Tenth Presidential Library: The Bush Presidential Materials Project, 1993–1994". George Bush Presidential Library. Archived from the original on April 10, 2007. Retrieved March 22, 2007. ↑ Healy, Patrick (May 19, 2007). "A Candidacy That May Test a Friendship's Ties". The New York Times. Retrieved May 22, 2011. ↑ "People of the Year: Bill Clinton and George H. W. Bush". ABC News. December 27, 2005. Retrieved September 5, 2010. ↑ "Univision CEO Joe Uva to Receive One America Award". National Italian American Foundation. Archived from the original on June 12, 2012. Retrieved July 30, 2016. ↑ "George H. W. Bush Endorses McCain for President". The Washington Post. February 18, 2008. Retrieved March 28, 2008. ↑ Neuman, Johanna (February 18, 2008). "Former President Bush Endorses McCain". Los Angeles Times. Archived from the original on March 14, 2008. Retrieved March 28, 2008. ↑ "Future USS George H. W. Bush to Transit". Naval Sea Systems Command Public Affairs. December 18, 2008. Retrieved December 22, 2008. ↑ Jones, Matthew (January 10, 2009). "Carrier awaits a call to come to life in ceremony today". The Virginian Pilot. Landmark Communications. Retrieved January 10, 2009. ↑ "Former President Bush Visits Namesake Aircraft Carrier". ↑ For the transcript of Obama's remarks honoring Bush, see "2010 Presidential Medal of Freedom Ceremony". The White House. February 15, 2011. ↑ "Photo P012712PS-0676". 2012-01-27. The Whitehouse. Retrieved April 24, 2013. ↑ Peppers, Margot (April 9, 2013). "A beaming George H W Bush poses for a photo". The Daily Mail. London. Retrieved April 24, 2013. ↑ Edwards, Breanna (July 24, 2013). "George H.W. Bush shaves head". Politico. ↑ Baker, Peter, "Bush 41 Reunion Looks to Burnish His Legacy", New York Times, April 3, 2014. Retrieved April 4, 2014. ↑ Edelman, Adam, "George H.W. Bush honored with Kennedy Profile in Courage Award", New York Daily News, May 4, 2014. Retrieved June 1, 2014. ↑ "Former U.S. President Honored with Ansary Prize". Mt. Vernon web page. Archived from the original on June 2, 2014. Retrieved March 18, 2016. ↑ Senior staff, mountvernon.org. Viebranz is identified as president and CEO of George Washington's Mount Vernon. Retrieved June 14, 2014. ↑ "Presidents Day 2014 - Barbara Lucas", mountvernon.org. Lucas is identified as regent of Mount Vernon's Ladies' Association. Retrieved June 14, 2014. ↑ "George H. W. Bush SKYDIVES for His 90th Birthday!". TMZ. June 12, 2014. Retrieved July 2, 2014. ↑ Jackson, David (June 12, 2014). "George H.W. Bush takes one last skydive for 90th birthday". USA Today. Retrieved July 2, 2014. ↑ "George Bush on Twitter". Retrieved June 22, 2015. It's a wonderful day in Maine -- in fact, nice enough for a parachute jump. ↑ McAfee, Tierney (October 12, 2015). "PHOTO: George H.W. Bush Throws Out First Pitch at Astros Playoff Game in First Public Appearance Since Neck Injury". People. Retrieved January 31, 2016. Barilleaux, Ryan J.; Stuckey, Mary E. (1992). Leadership and the Bush Presidency: Prudence or Drift in an Era of Change. New York: Praeger. ISBN 0-275-94418-2. Ducat, Stephen J. (2004). The Wimp Factor: Gender Gaps, Holy Wars, and the Politics of Anxious Masculinity. Boston: Beacon Press. ISBN 0-8070-4344-3. Duffy, Michael; Goodgame, Dan (1992). Marching in Place: The Status Quo Presidency of George Bush. New York: Simon & Schuster. ISBN 0-671-73720-1. Greene, John Robert (2000). The Presidency of George Bush. Lawrence: University Press of Kansas. ISBN 0-7006-0993-8. Hyams, Joe (1991). Flight of the Avenger: George Bush at War. San Diego: Harcourt Brace Jovanovic. ISBN 0-15-131469-1. Kelley, Kitty (2004). The Family: The True Story of the Bush Dynasty. London: Doubleday. ISBN 0-385-50324-5. Patterson, James T. (2005). Restless Giant: The United States from Watergate to Bush v. Gore. Oxford University Press. ISBN 9780195122169. Tarpley, Webster G.; Chaitkin, Anton (2004) . George Bush: The Unauthorized Biography. Washington: Executive Intelligence Review. ISBN 0-930852-92-3. Bush, George H. W. (1999). All the Best, George Bush: My Life in Letters and Other Writings. New York: Scribner. ISBN 0-684-83958-X. Bush, George H. W.; Scowcroft, Brent (1998). A World Transformed. New York: Knopf. ISBN 0-679-43248-5. Bush, George H. W.; Bush, Barbara (2009). "Interview with: George W. Bush, Barbara Bush" (Interview). Interview with McGrath, Jim. Retrieved October 8, 2014. Bush, George W. (2014). 41: A Portrait of My Father. Crown. ISBN 978-0553447781. Bush Koch, Dorothy (2006). My Father, My President: A Personal Account of the Life of George H. W. Bush. Grand Central Publishing. ISBN 0446579904. "George H. W. Bush collected news and commentary". The Wall Street Journal.